Don't Let Rodents Invade Your Home or Business. Don't Let Insects Invade Your Home or Business. Serving the San Antonio area since 1946. 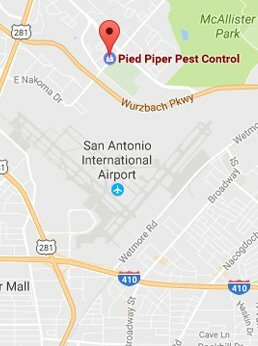 Established in 1946, Pied Piper Pest Control is a locally owned and operated, full-service pest management company offering an array of commercial and residential pest control solutions with over 75 years experience. Our main focus is to provide our residential and commercial customers with quality pest management service and control. Let us effectively and efficiently treat your property and your pest infestations. So whenever you encounter a pest problem and need protection, allow Pied Piper Pest Control to be your first line of defense. We offer free estimates, free inspections, and senior and military discounts. A consistent, proactive approach is necessary to eliminate and prevent unwanted pests from invading your home. Let us work with you to create a customized service plan for your needs. Pest control isn’t just about eliminating the pests you can see; it’s about the peace of mind that comes from knowing you’re protected. Whether you have ants, spiders, roaches, mice or mosquitoes, we’ve got you covered. Whether you have squirrels, bats, raccoons, possums, or skunks, in your home or business our certified and trained inspectors will find the perfect solution to get rid of the wildlife in a safe and humane way as well as provide you with a plan to prevent future infestations. We want your business to operate without the hassle of pest problems. Let us give you peace of mind by customizing a pest management plan that ensures protection for your business. They were wonderful, very kind, respectful, profession and did a great job. I would recommend to others. If I spot any insects or termites, I just give them a call. They come out and inspect. If there's anything there, they use whatever is necessary to kill them. I heard about Pied Piper on KSLR Radio last year. They helped with a big mouse problem and we have been using them monthly ever since. Great people who care about our home and our dog. Whether it is termites, bed bugs, cockroaches, or another type of invasive pest, our expert inspectors will locate the source of your problem, and offer you the best treatment plan. We are committed to your family’s safety and to our environment by using the least toxic and most environmentally friendly products available to control pests inside and out your home.